We will have to wait until the second half of the century for fusion reactors to start generating electricity, experts have announced. A new version of a European "road map" lays out the technological hurdles to be overcome if the processes powering the Sun are to be harnessed on Earth. 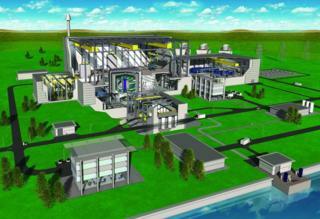 The road map has been drawn up by scientists and engineers at EUROfusion. This is a consortium of European laboratories and universities that funds research on fusion energy. The original version of the road map, published in 2012, forecast that a demonstration fusion power plant known as DEMO could be operating in the early 2040s, in order to supply electricity to the grid by 2050. But in the updated version, yet to be released, DEMO would not start running until "early in the second half of the century". A related document that provides more detail on DEMO's design says that operations would start after 2054. The setback has been caused largely by delays to ITER, a 20bn-euro reactor that is currently being built in the south of France to prove that fusion energy is scientifically and technically feasible. In fact, according to EUROfusion's programme manager, nuclear physicist Tony Donné, DEMO's schedule could slip further, depending on progress both with ITER and a facility to test materials for fusion power plants that has yet to be built. "2054 is optimistic," he says. "It is doable but we need to align political decision makers and get industry involved." Fusion involves heating nuclei of light atoms - usually isotopes of hydrogen - to temperatures many times higher than that at the centre of the Sun so that they can overcome their mutual repulsion and join together to form a heavier nucleus, giving off huge amounts of energy in the process. In principle, this energy could provide low-carbon "baseload" electricity to the grid using very plentiful raw materials and generating relatively short-lived nuclear waste. But achieving fusion in the laboratory is a daunting task. Doughnut-shaped reactors known as tokamaks use enormous magnetic fields to hold a hot plasma of nuclei and their dissociated electrons in place for long enough and at a high enough density to permit fusion. ITER, in fact, represents the culmination of 60 years of research. The world's largest ever tokamak, it will weigh 23,000 tonnes and is designed to generate 10 times the power that it consumes. But the project has been beset by delays and cost overruns. Originally foreseen to switch on in 2016 and cost around 5bn euros, its price has since roughly quadrupled and its start-up pushed back to 2025. Full-scale experiments are now not foreseen until at least 2035. As well as being technically very demanding, ITER is also complex politically. It is an international project with seven partners: China, the European Union, India, Japan, South Korea, Russia and the United States. As host, Europe is paying the biggest share of the costs - about 45%. European research organisations set up the road map five years ago to guide the research needed to achieve fusion electricity by 2050. In doing so, they were mindful of competition from other ITER partners; both China and South Korea having started to design their own demonstration reactors. The roadmap sees ITER as the single most important project in realising fusion but not one that is designed to generate electricity. DEMO, a tokamak adapted from the ITER design which would also cost billions of euros, is intended to produce several hundred megawatts of electricity for the grid. To do so, it must run continuously for hours, days or ideally years at a time, as opposed to ITER, which will operate in bursts lasting just a few minutes. In addition, DEMO will have to generate its own supply of tritium (the radioactive isotope of hydrogen which can help drive fusion) by using neutrons it produces to transform lithium (its other hydrogen isotope, deuterium, can instead be extracted from sea water). Researchers are already starting to develop conceptual designs for DEMO. But because they need results from ITER to draw up a detailed engineering design, their progress is vulnerable to any further delays in France. The person who coordinates this work, EUROfusion nuclear engineer Gianfranco Federici, describes the revised road map as "realistic but very ambitious". He says its success will depend not only on progress with ITER but also on the heads of European labs sacrificing some of their own research projects to concentrate on the design and R&D laid out in the plan. He reckons that this shift in priorities will not be easy. He says that physicists "are searching for the holy grail, the perfect plasma", whereas the roadmap embodies a more "pragmatic" approach to realise fusion energy as quickly as possible. Federici argues it is vital to demonstrate electricity generation from fusion "not too far after the middle of the century". Otherwise, he says, there may no longer be a nuclear industry able to build the commercial fusion plants that would follow, and the public may lose patience. The subsequent loss of political support, he wrote in the DEMO design report, "would run the risk of delaying fusion electricity well into the 22nd century." Robert Goldston, a physicist at the Princeton Plasma Physics Laboratory in the US, is more optimistic. He is "very confident" that ITER can produce "industrial amounts of heat" and believes that once it has done so generating electricity from fusion will be "a question of commitment of manpower". But he says that commercial power plants won't necessarily use tokamaks. An alternative, he says, is the stellarator - a reactor exploiting strangely-shaped magnets that is hard to build but potentially easier to operate. Meanwhile, in recent years a number of private companies have started investigating smaller, cheaper alternatives. One such company is Tokamak Energy in Oxfordshire, which is developing a spherical-shaped tokamak that creates magnetic fields using high-temperature superconductors. The firm has yet to generate fusion reactions, but nevertheless aims to put electricity into the grid by 2030 - using a reactor perhaps 100 times smaller than ITER. "We see fusion as a series of very substantial engineering challenges," says the company's chief executive David Kingham. "The physics doesn't have to be perfectly understood." Federici agrees that engineering is now key to building working fusion plants. But he is sceptical that the newer, cut-price proposals will do the job, arguing that they face daunting design challenges. "Cheap, fast and small is something that fusion will never be," he says.